Primitive conditions make pathfinding skills handy for travelers interested in following these trails from the West Turkey Creek Road into Rock Creek Canyon and beyond. Turkey Pen Trail begins its journey to the crest at the Turkey Creek Ranger Station, just upstream of West Turkey Creek Campground. From that point it goes up and over a saddle into Turkey Pen Canyon. The trail follows this canyon upstream about a half mile to the point where the Hughes Tank Trail #262B climbs up and over a divide into Lower Rock Creek Canyon. This route provides access to Lower Rock Creek Trail #259A. Another half mile up Turkey Pen Canyon, the main trail leaves the canyon to climb up and over another saddle into Upper Rock Creek Canyon. There it joins the Upper Rock Creek Trail #259. Trail #259 heads up canyon for some distance then switchbacks up and out of the drainage to a junction with the Bootlegger Trail #257 and Rattlesnake Trail #275. 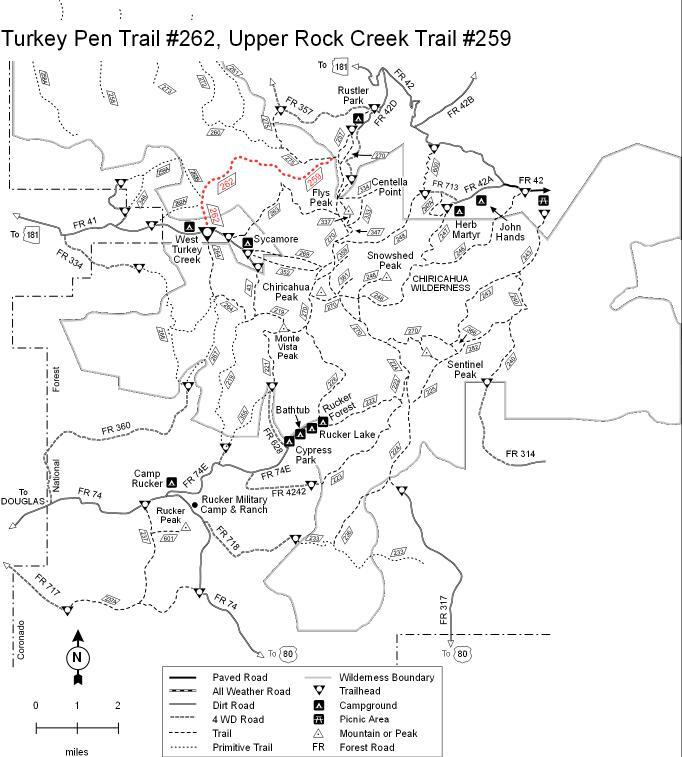 It's a short hike along the Bootlegger Trail to the Crest Trail #270, if that is where you're destined. These trails are not regularly maintained, so how easy they are to follow depends on how much they are being used. Maintenance on primitive trails is limited to removing obstructions and repairing damage that results from use. In many places, that means you'll be following the streambed. These trails are primitive; traveling them by horse or mule is not recommended. Both canyons support healthy riparian areas that provide a pleasant setting for your journey and make for good wildlife watching along the way. Views from the saddle between the canyons, and from the upper stretches of the climb to the crest, add spice to the trip.